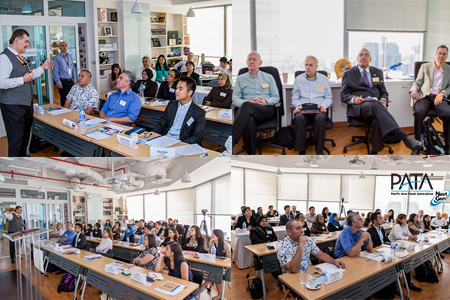 Bangkok, Thailand, 2013-12-11 — /travelprnews.com/ — Twenty-five rising star travel professionals from 13 destinations gather today for the first PATAcademy-HCD on December 11-14, 2013 at the PATA Engagement Hub in Bangkok. The PATAcademy demonstrates PATA’s next generation commitment to lifetime Human Capital Development (HCD). Twenty-five rising stars nominated by their organisations, with, on average, five years’ work experience, hail from Bangladesh, Bhutan, China, Guam, Hong Kong SAR, Indonesia, Kazakhstan, Lao PDR, Macau SAR, Malaysia, Nepal, Singapore and Thailand. Participants will experience advanced level classroom interaction with leading practitioners and take field visits to see best practices in action in and around Bangkok. Best practice and site visits will be key components of the tourism training course. The PATAcademy-HCD participants will visit the Siam Niramit, a world-class performance of Thailand’s arts and cultural heritage. This must-see spectacular is performed on the gigantic stage now listed in the Guinness Book of World Records, featuring over 150 performers with as many as 500 costumes. Enhanced special effects with the world’s most advanced technology are used to produce a stimulating, very realistic and inspiring experience. The PATAcademy-HCD group will also visit Le Cordon Bleu Dusit Culinary School which will provide insights and a tour of facilities. Participants will receive a briefing on standards of the Le Cordon Bleu programmes and insights into professional Thai cuisine preparation, which is unique to Le Cordon Bleu Dusit. The best of French and Thai culinary operations in business will be explained. This entry was posted in Tour Operators, Tourism, Travel, Travel Agents, Travel Human Resources, Travel Management, Travel Services and tagged Bangkok, Bangladesh, Bhutan, China, Guam, Hong Kong SAR, Indonesia, Kazakhstan, Lao PDR, Macau SAR, Malaysia, Mr Martin J Craigs, Mr Peter Semone, Nepal, PATA Engagement Hub, PATAcademy-HCD, Singapore, thailand, travel professionals. Bookmark the permalink.